Facebook has always been very strict about the formatting it allows its users to do on the text that composes their posts. 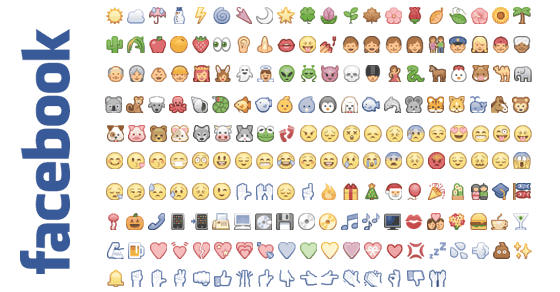 However, there is a small set of symbols called Emoji Emoticons that, when pasted into Facebook’s status and chat boxes, are transformed into colorful images! The list of these special symbols is very long, so we created a simple cheat sheet to facilitate the process and the choice of the right Emoji Emoticon. Simply select the symbol in black, paste onto Facebook’s text box and, once published, it will be replaced by the corresponding image below. Depending on the browser you are visualizing the cheat sheet with, some of the symbols may appear as a small square – copy that symbol, it will work anyway. Note that Facebook limits the number of times that these symbols can be used on a single post. Copy and paste symbols in black onto Facebook in order to convert to the corresponding image. Copy and Paste > ? ? ? ☺️ ? ? ? ? ? ? ? ? ? ? ? Copy and Paste > ? ? ? ? ? ? ? ? ? ? ? ? ? ? ? Copy and Paste > ? ? ? ? ? ? ? ? Copy and Paste > ? ? ? ? ? Copy and Paste > ? ? ? ? ❤️ ? ? ? ? ? ? ? ? ? ? Copy and Paste > ? ? Copy and Paste > ? ? ? ? ? ? ? ? ? ☎️ ? ? ? ? ? Copy and Paste > ? ? ? ? ? ? ? ? ? Copy and Paste > ☕ ? ? ? ? ? ? ? ? ? ? ? ? ? ? Copy and Paste > ? Copy and Paste > ⛵ ? ? ✈️ ? ? ? ? ? ? ? ? ? ? ? Copy and Paste > ? ? ? ? ? ? ? ⚠️ ? ? ⛽ ♨ ? Copy and Paste > ? ? ? ? ? ? ? ? ? ? ? ⛪ ? ? ? Copy and Paste > ? ? ⛺ ? ? ? ? ? ? ? ? ⛲ ? ? Copy and Paste > ? ? ? ? ? ? ? ? ? ? ? ? ? ? Copy and Paste > ? ? ? ? ? ? ? ? ? ? Copy and Paste > ? ⭐ ☀️ ☁️ ⚡ ☔ ⛄ ? ? ? Copy and Paste > ✉️ ? ? ? ? ? ? ? ? ✂ ? Copy and Paste > ? ? ? ? ? ⚽ ⚾ ? ? ⛳ ? ? ? Copy and Paste > ? ? ? ? ? ? ? ? ㊙️ ? ? ? ? ? ? Copy and Paste > ⚪ ? ? ⬜ ⬛ ? ? ? ? ? ? ? ? ? ? Copy and Paste > ? ✨ ? ? ? ? ? ? ? ? ? ? ? ?